The Nordictrack T 8.5 S is built to last with a 3.5 chp motor that cools itself, and supports speeds up to 12 mph. Includes many features like 50 built in workouts, space saving fold-able running deck that is spaciously sized at 22” x 60” — Plus a 10 inch HD color touchscreen to stream iFit trainer led runs and studio classes on. A Great Buy! To learn more about features important in a treadmill checkout our guide on how to buy a treadmill. The best part is it includes a one year membership to iFit (a $396 Value) for access to the best trainers with spectacular destination runs and walks in fab locations across the globe including Iceland, Antarctica, Switzerland, Bora Bora, Thailand, Italy and so many more – your workouts will never be boring and if you want to leverage the power of the group – take a studio class! There are over 10,000 to choose from. Learn more about — why iFit — with your Nordictrack or Proform equipment. Jill’s Steals and Deals – click buy here to get the best deal. Checkout the T 9.5 S treadmill, part of Noridctrack’s T Series. if you prefer a larger screen. You will pay a little more for a 14” Smart HD Touchscreen to view your iFit sessions and trainer led destination runs. This is more of a preference decision as the tread otherwise is the same Follow-link to learn more and for best deal price. — Best price ever from Proform featured on Jill’s Steals and Deals. This is a commercial grade treadmill perfect for multiple users, daily use and even longer mileage workouts. The Pro 2000 is built to last with a 3.5 hp motor that cools itself, 12 mph and a 15% incline for twice the calorie burn in less time - EVEN IF YOU'RE JUST INTO WALKING this equipment will serve you well. Includes loads of features like 32 built in workouts, space saving technology to fold-up and store, dual fans, Bluetooth, plus a spacious 22” x 60” shock absorbing deck. A Great Buy. Learn more about — why iFit — with your Proform equipment. HIIT is a training technique that involves repetitively giving 100% effort for a set amount of time followed by short recovery periods. You’ll keep your heart rate up, burn a ton more calories, and build strength in one workout. Part of the main reason this machine is so effective is that the HIIT Trainer Pro simulates stair climbing and boxing, allowing you to work your calves, hamstrings, quads, glutes, biceps, and triceps—all in a single movement. The HIIT Trainer Pro comes with a 10 inch smart color touchscreen and has a small footprint taking up half the space of a normal elliptical exercise machine, so it can fit anywhere in your home. ALSO Included you get a 1 year membership to iFit Coach (a $396 value when you purchase at Proform) with the best professional instructors who take you through trainer-Led workouts all around the globe beautifully displayed on equipment’s touchscreen. iFit Fresh Start Kit - Checkout the accessories. Bundle of Get Started Gym items that make your home workouts possible. 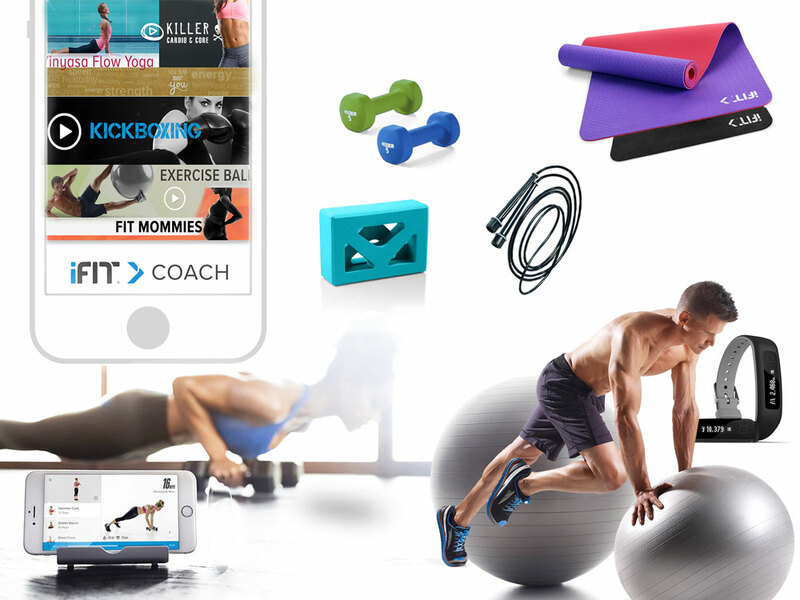 You can access iFit Coach workouts for each item so you stay motivated and don’t get bored. Includes a fitness ball, two (2) 5lb. weights, a speed jump rope, a high quality 6mm yoga mat and brick. Update your iFit Coach membership for video workouts, nutrition guidance, sleep tips and get a wearable tracker to help you meet your goals.